T-shirts, Hoodies, Jerseys, Tank tops, Hats & More! 750 HP in the Making! 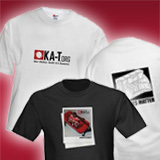 KA-T.org was founded in 2002 by Rick Merina. With the influx of SR20 swaps throughout the nation, he decided to try out something different - turboing the KA. Although some proved it's subtle potential in the early days (pioneers like Chris May, Duy Bui and Angelo Foreman), it was still a untouched animal. He soon joined forces with Ryan Klatt, who he shared a similar vision with, in building an online community with other KA-T members around the country. Although not starting out with much, the forum size began to take off and make a name for itself. As both finished their projects, they flooded the forums with their gathered research (photos, videos, product writeups, parts recommendations, dyno sheets, timeslips, etc). Soon after that, they began to put the spotlight on other featured rides and made "legends" out of them. Although Rick and Ryan's passions have evolved over the years, their dedication to the site and raising the bar for the KA/240sx community has not failed - they wouldn't have done it without their supportive members, moderators and sponsors!